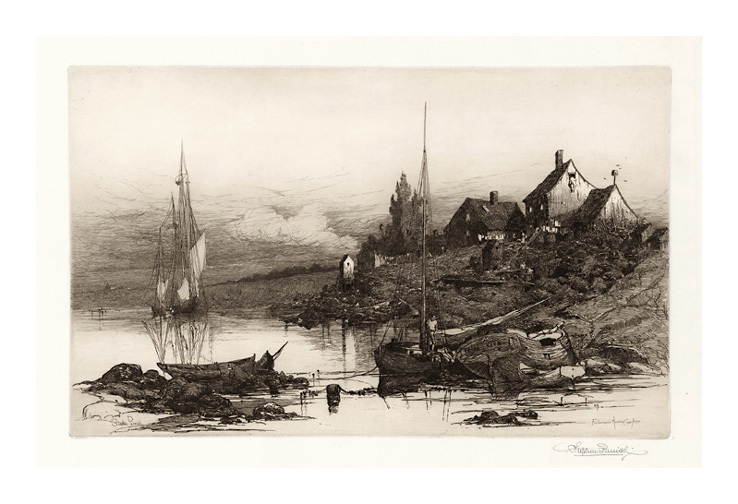 Fisherman's Houses - Cape Ann- 1881, Etching. Schneider 49. Edition not stated. Only state. Signed in pencil. Signed and titled in the plate, lower left and right. Image size 11 3/4 x 18 3/4 inches (298 x 476 mm); sheet size 14 13/16 x 21 5/8 (376 x 549 mm). A fine, rich impression in dark brown ink, on off-white wove paper, with full margins (1 1/2 to 1 5/8 inches), in excellent condition. Collections: AFGA, BA, BALT, BMFA, CAHA, CAI, CWAM, DIA, LBA, MIA, NYPL, PAM, PMA, VC. 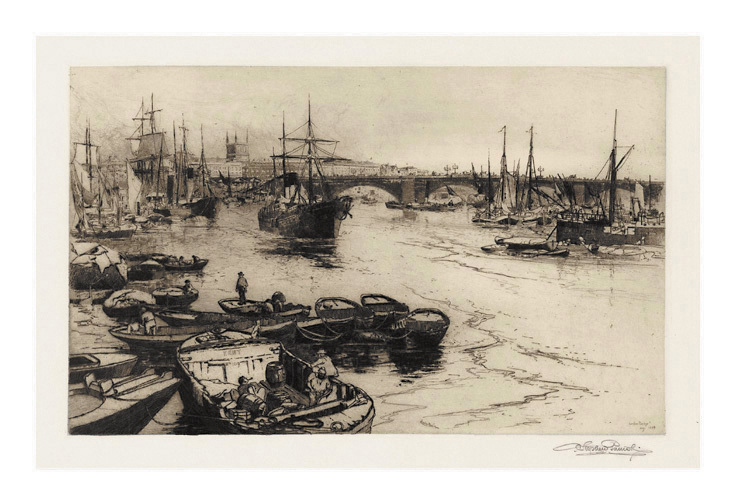 London Bridge - 1884-1885, Etching. Schneider 109. Edition not stated. Only state. Signed in pencil. Signed, titled,and dated in the plate. Image size 11 5/8 x 18 1/2 inches (295 x 470 mm); sheet size 16 7/8 x 23 7/16 (429 x 595 mm). A fine, rich impression in dark brown ink, on cream wove paper, with full margins (2 3/8 to 3 inches), in excellent condition. Collections: BALT, HAM, MIA, NMAH, NYPL, TMA. 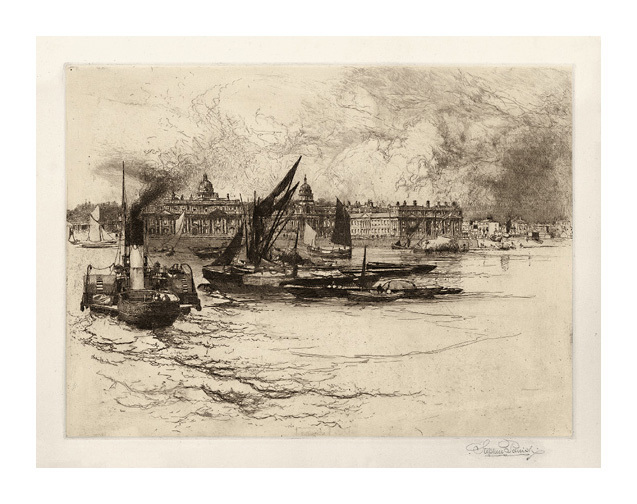 Greenwich Hospital - 1884-1885, Etching. Schneider 108. Edition not stated. Only state. Signed in pencil. 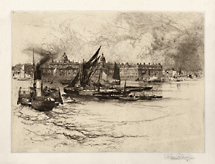 Titled Greenwich faintly in the plate, lower middle. Image size 12 x 16 inches (305 x 406 mm); sheet size 18 7/16 x 23 3/16 (468 x 589 mm). A fine, rich impression in dark brown ink, on cream wove paper, with full margins (3 3/8 to 3 1/2 inches), in excellent condition.